Start your side table at the top. We offer a growing selection of styles to match your sit-stand top. We recommend measuring your office to help determine an ideal top size. 60" and 72" widths are the most popular. Wire grommets conveniently pass-through the tabletop down to your outlet. Or install power grommets for accessible outlets on your tabletop. Make your table mobile with locking standard or heavy duty casters. You'll be organizing and optimizing your space in no time! The 2-Leg Side Table is available with any of our popular top styles. Choose from Eco, Laminate, Bamboo, Rubberwood Solid Wood, Reclaimed Wood, or Solid Wood. Enjoy your pick of Walnut, Ash Gray, Mahogany, Cherry, or Maple GREENGUARD Laminate finishes. Build your office suite to match your existing desk for a cohesive look. Our carbonized Bamboo features a striking caramel color and provides a durable surface for tasking. 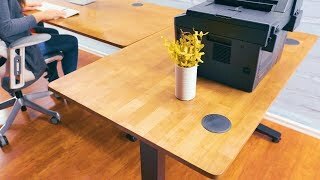 Eco or Laminate tops are a sleek update to the company office space. If wood is more up your alley, choose from Reclaimed Wood, Rubberwood, or a custom Solid Wood tabletop. You won't go wrong with the multitude of top options available for the 2-Leg Side Table. Make your 2-Leg Side Table as small or as big as you need. The 2-Leg Side Table is available in our complete line of top sizes. Tabletop widths range from 48 inches up to 80 inches, with a depth of 30 inches. Use your 2-Leg Side Table to store a printer or any other accessories that are not accessed as often. Or put the fixed table next to your sit-stand UPLIFT Desk for an L-shaped desk with one movable section. The combination of office designs is endless. Consult the table below for the availability of each top style and size. Eco Rectangular Width: 48", 60", 72", & 80"
Laminate Width: 48", 60", 72", & 80"
Bamboo Rectangular Width: 48", 60", 72", & 80"
Rubberwood Solid Wood Width: 48", 60", 72", & 80"
Reclaimed Wood Width: 48", 60", & 72"
Solid Wood Width: 48", 60", 72", & 80"
The 2-Leg Side Table comes with a fixed-height frame, which is available in black, gray, white, and now metallic (industrial style) powder-coated finishes. Functionality is at the forefront of the design of the Side Table frame. The shape of the frame provides a sturdy base of support. While the columns on the legs echo the design of the UPLIFT Frame, sans the movable three-stage aspect. If you would like to make your UPLIFT Desk mobile, you can outfit it at any time with our Desk Casters. Available in a set of four or five for every UPLIFT Desk model, these locking casters make your table even more versatile. They work great on either hard floors or low pile carpeting. For safety and stability, the casters lock to keep the table in place. For those who like to rearrange their spaces frequently or move a lot, casters make moving your table a breeze. Please note: Casters will add approximately 2" of height to your table. Nothing will get in the way of your UPLIFT Desk when you add Heavy Duty Locking Casters. Your UPLIFT Desk will glide over uneven surfaces, cables, and even debris with these wheels in place. Their durable construction will put your mind at ease as you push your fixed height table to a new location. Each caster is 4 inches in diameter and boasts a 265-pound weight capacity. And when mobility isn't necessary, just lock each caster in place with a foot-activated locking mechanism. Please note: Heavy Duty Casters will add approximately 5" of height to your table. 48x30 > 48" x 30"
Width range 47" - 72"
How is a fixed-height frame any different from your three-stage frames? We designed the 2-Leg Side Table to look like our height-adjustable frames, but since the legs are one continuous column and there is no motor, the frame remains stationary and does not adjust for height. This allows you to create a side table that houses your personal items and things like printers and decor, one that matches your UPLIFT Desk and space ideally. How do I build my table? The same way you build an UPLIFT Desk! Just go through our easy-to-use desk builder and pick the tabletop and frame color that completes your space. Add wire or power grommets to give your table space to route cords and power devices. Why would one need a fixed height side table? If you've ever lacked surface area for your stuff or wanted to build a DIY side table for your UPLIFT Desk, a fixed-height frame is an affordable and time-saving solution that simplifies the accent table building process. Just pick a style and size of top we offer to get started. After a simple assembly you'll have a stylish new side table that suits your office style! Do I have any color options for the frame? Yes, you'll be able to get 2-Leg Side Tables in white, gray, black, and metallic color options. Build your office suite to match your existing desk for a cohesive look. Our carbonized Bamboo features a striking caramel color and provides a durable surface. Eco or Laminate tops are a sleek update to the company office space. If wood is more up your alley, choose from Reclaimed Wood, Rubberwood, or a custom Solid Wood tabletop. Which ever top style you choose for your 2-Leg Side Table, rest assured knowing you're investing in a sturdy top that will stand next to you for years, one which you can match with your UPLIFT Desk. The 2-Leg Side Table comes with a fixed-height frame, which is available in black, gray, white powder-coated finishes. And now, metallic (industrial style). If you would like to make your 2-Leg Side Table mobile, you can outfit it at any time with our Desk Casters. Available in a set of four or five for every UPLIFT Desk model, these locking casters make your table even more versatile. They work great on either hard floors or low pile carpeting. For safety and stability, the casters lock to keep your side table in place. For those who like to rearrange their spaces frequently or move a lot, casters make moving your table a breeze. Please note: Casters will add approximately 1.5" of height to your side table. We give you the option to add wire or power grommets to your desktop. Two wire grommets come standard on all UPLIFT Desktops. Wire Grommets let you route your cords and cables through a swiveling slot that opens and closes on your desk. Or upgrade to a Power Grommet, which adds a duo of power outlets to each grommet hole, giving you freedom to power and charge devices straight from your desktop. Grommets are located fifteen inches from the center of the desk, to the left and right. In our ergonomic experience, we have found that this is an ideal spot for the best combination of cable management and accessory use. We stand behind the quality of our products and their high level of craftsmanship. That's why we're proud to offer a market-leading 7-year warranty standard on all our desks. UPLIFT Desk Solid Wood Desktops are made to order, from scratch, by our local expert woodworkers, so no detail is forgotten when building your Solid Wood Desk. This means that some of our Solid Wood Standing Desks may take some time to make and ship to you. When you need your desk sooner than the estimated ship date on our listing, we have a selection of temporary "scratch and dent" desktops that are ready to ship now in our warehouse in Austin. These scratch and dent tops are fully functional, just maybe with a ding, scratch, or dent here or there, and are affordable solutions to get you working quicker. Tell us you want a temporary top and we'll send you the best one we have in stock in the closest size to your Solid Wood Desktop. If your desktop's size is not standard, we'll ship the next smallest size. For example, if you order a 55" desktop, we'll ship you a 48" scratch and dent top. Enjoy your temporary setup with a Walnut, Ash Gray, Maple, Cherry, or Mahogany laminate desktop, giving you a stand-in top until we can ship your Solid Wood Desktop to you. Please note that the scratch and dent temporary desktop option is not available with Room of Choice delivery or Room of Choice delivery with Installation without incurring a separate fee, as our technicians will need to make two trips for assembly and disassembly. Please contact a member of our sales team via live chat or phone at 800-349-3839 if you'd like to get a custom quote for this service.